with such distrustful leaders from the army under Cheif of Staff Brigadier Collins. “...a pro-active, courageous and co-ordinated approach from all stakeholders will stop the slide into narco-anarchy and the end of Guyana's last chance at becoming an ordered society, I again call upon you to let us band together this day and pledge to give our people some hope.”—The Brigadier on the 40th anniversary of the army, 2005. Chief of Staff, Edwards Collins, 2005. Right, FBI supposedly assisting the army in the investigations. Recently, in light of two Sunday editorials by Stabroek News about the army, I have listed a few questions for the Brigadier Edwards Collins, the Chief of Staff. I raise these questions for the sake of legitimate documentation. 1. 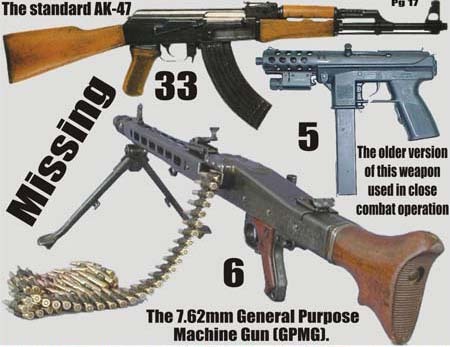 Would the final army report about the missing guns be made available to media houses, as it should be, and the findings subjected to external audits? After all, the army cannot be trusted to conduct an investigation into its own mishaps?especially in light of events these past few months. 2. The Chief of Staff claims that no one is immune from interrogations. If so, why have the homes of the "masterminds" involved with the Buxton Gang, not raided and those individuals? names not in the papers, although they are at the center of a national security dilemma? 3. On April 2, Lt. Col. Claude Fraser said the army was "pretty sure that the guns are not being moved around but that they are locked down somewhere." He did not mention anything about 2001 or 30 AK-47s being missing (not 33). Was critical information withheld from the public? 4. 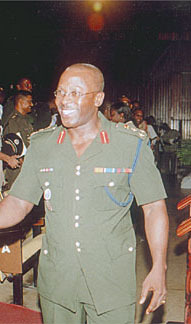 On April 6th, the last "briefing" by Brigadier Collins was done at the Police Officers' conference, where the revealing information was made public. Are we to assume that between April 2 and April 6, the army made critical discoveries? Would the media be allowed to verify the genesis of this change? 5. Why was the "briefing" by the brigadier done at the police conference? Was this to deflect attention, since the conference was already shrouded with the Felix controversy? 6. 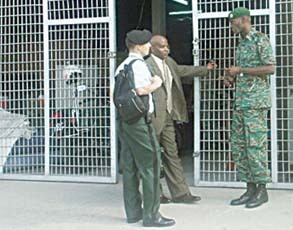 In a time when every word from the army needs to be carefully measured, what does the brigadier mean by saying that the army wants to return "national security" (or Guyana) "back to the point where it was before the disappearance" of the weapons, knowing well that "national security" has been under threat since 2001, if not before? 7. Does the brigadier think that the noticeable silence from the PNC on the grave army lapse would historically affect the image of the army, given that historians would interpret this as evidence of a supposed collusion between the army and PNC interests? One of the AK-47 which we on this website believe was placed by the "masterminds" of the Buxton Blueprint, to fault the East Indians of Enterprise. 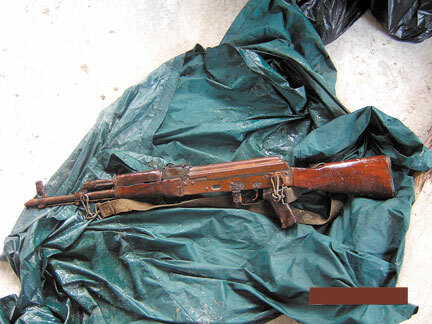 The army under Brigadier Collins issued a press release (June 3) which stated that the gun was found in a clump of bush in Enterprise. This was a diversion tactic to shift the attention away from the "masterminds" and top-brasses in the army and police to Roger Khan and also, strangely, to the people of Enterprise, ECD. 8. In similar light, is the brigadier concerned that in a racially polarized nation, at least half of the public now regards the true motive for joint-services raids, as a campaign against certain Indian businessmen (e.g., Roger Khan), a bogus search for guns? Take, for example, the Stabroek News cartoon (dated 04/02/06) in which the police commissioner is depicted as stompin? over the city while a rodent-like smuggler carrying his bag of weapons, watches bemused and says; ?An I done move out long time?hee hee.? 9. Does it matter to the Chief of Staff that the raid on the home of an Indian PNC MP is being seen NOT as a mistake, but as an army-police ploy to counter the aforementioned popular belief? 10. How high up the mountain has the trail led thus far? In other words, is any senior army figure being protected from investigation, given that it is rather suspicious that at the very least, no senior army official has been held for such a historic and colossal blunder?